P.K. Subban shot somehow rattles in. Meszaros joins Krug in the penalty box. 4-on-3 for 1:46 for the Habs. Andrej Meszaros gets sent off. Not good for the Bruins. 4 on 3 hockey coming up with Montreal on PP. Krug and Eller go to the box each. 4 on 4 hockey. Have seen that play called as unsportsmanlike conduct earlier in these playoffs. #Bruins not happy with Eller; Krug goes right after him. Started with the unnecessary push by Kevan Miller on Lars Eller. Mike Weaver is having an excellent game at both ends. Torey Krug is mighty feisty today. Sticking up for his teammates all over the place. Torey Krug and Eller. Krug isn't giving up. Lucic with another opportunity and gets denied. No goal. Puck went in off Lucic's glove. Bruins didn't celebrate after it went in. Replay was black and white. No goal. If only Lucic had kept his hand on his stick... Would have counted as a deflection. Looks like that goal went off Lucic's glove. They're reviewing right now. Lucic doesn't seem too thrilled. The Bruins, up 1-0 after a Daniel Paille goal in the first, are trying to set the tone early. You can see it with the team's constant pressure in the Canadiens' zone and the remarkable aggression with Montreal defenseman P.K. Subban. Bruins captain Zdeno Chara mixed it up with Subban at the end of the first period, resulting in a couple of unsportsmanlike conduct penalties on both of them. There's already been eight penalties between these two heated rivals. But it was a good period for the Bruins despite struggling on the power play. The Bruins failed to convert on two power play attempts, including a 5-on-3 for one minute, before Paille took a pass from Carl Soderberg and buried it with 6:58 left in the period. It was Paille's first goal of the postseason after missing the first round against the Detroit Red Wings with a head injury. The Bruins led the Canadiens in shots, 13-6. Tuukka Rask made a number of phenomenal saves, including one he snatched from Canadiens forward Max Pacioretty. 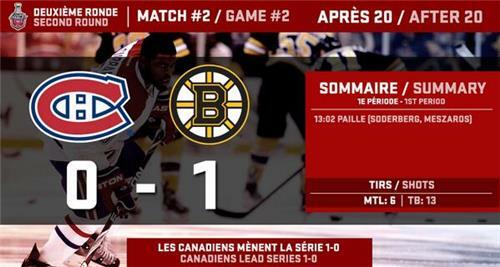 First period comes to a close with the Bruins up 1-0 over the Canadiens. Carey Price. Tout simplement spectaculaire. Canadiens greatly improved. Bruins aren't getting as many easy chances. Still very little possession for Montreal. End of the first period, #Bruins up 1-0 as Daniel Paille scores his first goal of the playoffs in just his 2d game. B's lead in shots 13-6. Four periods, 2 OTs, no sign of Thomas Vanek. Chara and Subban both get unsportsmanlike penalties. Subban and Chara both penalized. Subban and Chara both go to the box. #Bruins being very physical with Subban, not letting him get space to beat them like he did in Game 1. Chara and Dougie Hamilton both went after PK Subban. Tuukka Rask looks more comfortable so far. Not fighting the puck as much. Aggressive, confident.